COMPETITION IS NOW CLOSED- Thanks to all who entered. Hello there! I decided it was about time I gave something away on The Silver Chicken! 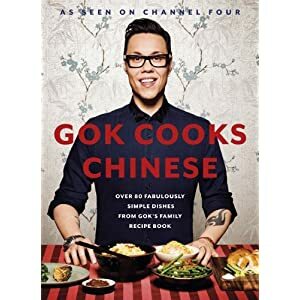 So here we go… I am giving away a copy of the brilliant Gok Cooks Chinese. I was glued to the series which aired recently. I watched every episode with interest and I was compelled to start cooking tasty stir-frys, pot-stickers and dumplings! Gok cooks up an array of delicious dishes in this series, and makes it all look so easy! I bought a copy of his book and thought I would also buy a copy for one of you nice people to win. To enter, look at the widget-dealy down below which I have been assured is the best way to handle such competitions. There are a number of ways to enter, which you can see in the widget. The more ways you enter, the better chance you have of winning! I will gladly post this book worldwide so no matter what corner of the globe you call home I will post it to you! I wish you the best of luck- and I hope this brings the winner many happy meals ahead!